If your Electronic Air Suspension (EAS) system is failing, replace it completely with a premium-quality lifted profile LR3 coil spring conversion kit from Atlantic British! Switching to a coil suspension can save LR3 owners hundreds or even thousands of dollars that would otherwise go to air suspension maintenance. This suspension kit is designed specifically for Land Rover LR3 (2005 – 2009) models and features high-quality Old Man Emu coil springs matched to new Atlantic British struts. Atlantic British’s coil kit makes converting to coils easy. The LR3/Discovery 3 suspension conversion kit comes with exclusive EAS reflash management software that keeps all of your vehicle’s control systems fully enabled – a feature you will not find anywhere else! 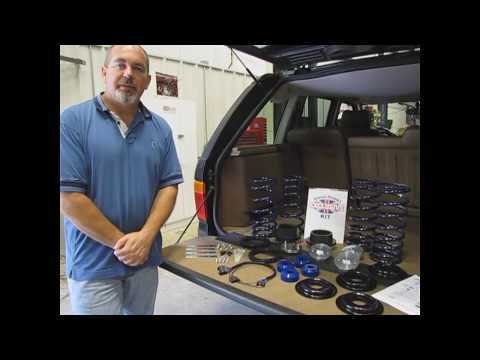 Atlantic British Ltd. Repair & Maintenance Academy How-To Video: In this video, Doug, our Land Rover Master Technician, will replace the Air Suspension with Our Coil Suspension Conversion Kit L319SRK-OMEHL on our 2006 Range Rover Sport 4.4 (non-supercharged). This kit also fits and is the same install process for the Land Rover LR3. Doug will then go over the installation of the EAS Re-flash module to remove dashboard codes. Atlantic British Ltd. Repair & Maintenance Academy How-To Video: In this video, Doug, our Land Rover Master Technician, will go over the installation of the Re-flash module to remove dashboard codes after installation of Our Coil Suspension Conversion Kit L319SRK-OMEHL on our 2006 Range Rover Sport 4.4 (non-supercharged). 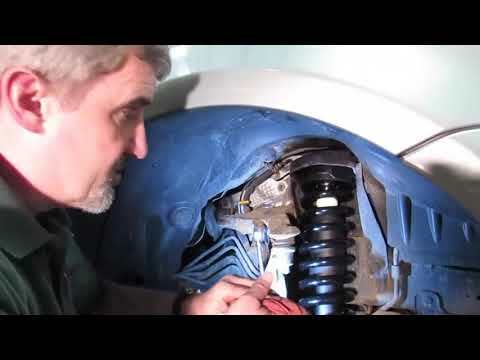 This same install process also applies to the Land Rover LR3. Does your costly LR3 air suspension got you down? Are you looking for a trail-rated solution that that boosts your LR3 with 2 inches of lift and heavy duty springs from Old Man Emu? Look no further than our Heavy Load Air Suspension To Coil Spring Conversion Kit With Atlantic British Struts & Old Man Emu Springs (L319SRK-OMEHL). It adds 2 inches of lift and features new custom struts from Atlantic British and our proprietary EAS Reflash Management Software. The reflash software comes in an easy diagnostic connector and eliminates dashboard warning lights and errors seen when removing your stock Land Rover air suspension (EAS). …But don’t take our word for it, check out our coil-spring kit in action with this LR3 off-the-grid video in the Rocky Mountains of Colorado! J'ai effectué le remplacement des 4 amortisseurs pneumatiques de mon LR3 2006 par ces amortisseurs et je suis très satisfait du résultat. Ils sont 2 po plus haut que les originaux, le look est très intéressant et le confort est identique. Le module électronique fourni fonctionne à merveille et les petits connecteurs pour effectuer le branchement sont ingénieux! It came with perfect and clear instructions on how to install and reflash the LR3. I’m still having error codes on my end but that’s mostly because I still haven’t installed the harness as the flashing tool didn’t work for me first try. But highly recommend if you’re going away from the air suspension. Took a little longer than expected to install (my own fault), but other than that I am loving what I'm seeing! Great product. Dont forget to unplug the height sensors! I have an 11 year old LR3. I was faced with a $5,000 repair of the Air suspension 3 weeks prior to a major road trip into New Brunswick and Cape Breton. They arrived in a few days. I had a local garage so the conversion in half of a day and then had the alignment done. The roads in Eastern Canada are brutal at times with 7% grades. I was fully loaded and had 4 bikes on a rack. The height of the rear dropped a wee bit but after off loading tents and bikes I was back to ride height and able to off road and explore with no issues. I recommend this product. If I was looking at more gear I would recommend the heavy duty option. I was tired of spending money on the EAS on a '06 LR3 with 207K miles and decided to switch to coils (went with the heavy duty option), I find the too mushy/sways too much but I guess it'll take some time to get used to it. I've not taking it off-road yet, we'll see how that goes. No regrets though! The coil over suspension kit from British Atlantic is very simple and straightforward to install. I would say that the 4 hour install time listed is pretty spot on. However, I would not include removing the EAS in that same timeframe. The reflash module is super simple as well. I did not wire the module permanently because I have read that with the 2" lift you may sometimes still get the red suspension fault light. I would definitely recommend the kit to others. The only thing I would like to see is a 1" spacer to push the lift to 3" and to help compensate for heavy loads. Not only is the customer service and shipping speed amazing but this coilover lift kit will make your LR3 look and drive 100 times better than it did before. No more lights on the dash and no more riding around on the bump stops if the air ride starts to act up. The stance is amazing and so is the ride !!!! The instructions are very easy to follow and make installation a breeze !!!! Trust me you won't be disappointed !!!! The conversion kit worked out great! The vehicle still rides great and the 2" lift gives it a nice looking stance. All necessary hardware was included and instructions were easy to follow. The only tad bit of information I wish that could have been included in the instructions, was to disconnect ride height sensors before moving to work on another side of the vehicle. I had to go back and remove the rear tires again to disconnect the sensors. The reflash worked well for the most part. It might be just be a coincidence but I gained an issue with the charging system after flashing. The consumer service, tech support and response times have been great! Dave and Doug have been a great help. We wasted over $2K on the compressor and sensors, and the final straw was a ruptured bag in the rear. You will no be disappointed. The ride is smooth, no more errors, and it looks good too. We already had bigger tires than were recommended, and now it works perfectly. Thank you! This is an awesome product. It was delivered on time and works as stated. The only thing I would say is make sure you disconnect the old height sensors when installing and you'll be fine. the added height for me came out slightly above 2 inches and handling is much better. As far as I can tell, this conversion is everything they claim it to be. I am in love with my lr3 again. I bought my 2005 LR3 used with EAS issues and could already see that maintaining it would have been too costly on an older vehicle. This kit was great! I installed it in my garage in a weekend - needed lots of PB Blaster and patience to get the old air struts off. Installation was easy after that. The flash module in-line cleared all alarms/lights. Note that the 2" lift requires unplugging the height sensors. The ride is great and the 2" lift looks perfect, I get a lot of comments on how it looks. I would recommend this if you are considering ditching the expensive air system and like the peace and quiet of no alarms. I claim 5 stars because of the quality of the kit and especially the ride, its not as rough as I was told it would be. I like the 2" lift because I plan on using larger tires on 18" wheels, its smooth and feels more like a sturdy SUV than a "softy soccer mom car", nice firm ride. I highly recommend this product you will not regret it. I had it installed at 4 Wheel Parts for $400. I love my LR3HSE again, Thanks Atlantic British! Wow, this is a really nice kit! Very easy to install and high quality. I was going to keep fixing the suspension faults and it was getting costly so i got rid of it. The conclusion is a much improved rid and the off road ability is the same (who cares about the straight axle mimic bullsh&t) this gives you a piece of mind that your suspension fault with larger tires wont stop you in your tracks. I run 275/65r18 duratracks with spacers and this kit. I get a little rubbing in the front otherwise perfect. Thanks AB for stocking this kit. I recommend all lr3 owners should switch to this coil kit!!! The factory air suspension on my 2005 LR3 V6 was on its way out and faced with the task of replacing it, I opted for the coil-over conversion. The added height with the Old Man Emu springs gives me enough clearance to run 265/70/18s with minimal rubbing and the ride is firm without being too rough. The install was relatively straightforward, it took me around 5 hours all told. The far side bolt is what gets you, install the kit and you'll see what I mean. The reflash module was easy to use. I had to go back and disable the ride height sensors to get all the warnings cleared, but overall I felt that this was a great value. Would recommend.